The Millenials’ Song W&L Students Perform "The Theory of Relativity"
“The Theory of Relativity” cast. Seated on the ground, l. to r.: Hannah Palmatary and Logan Wilson. 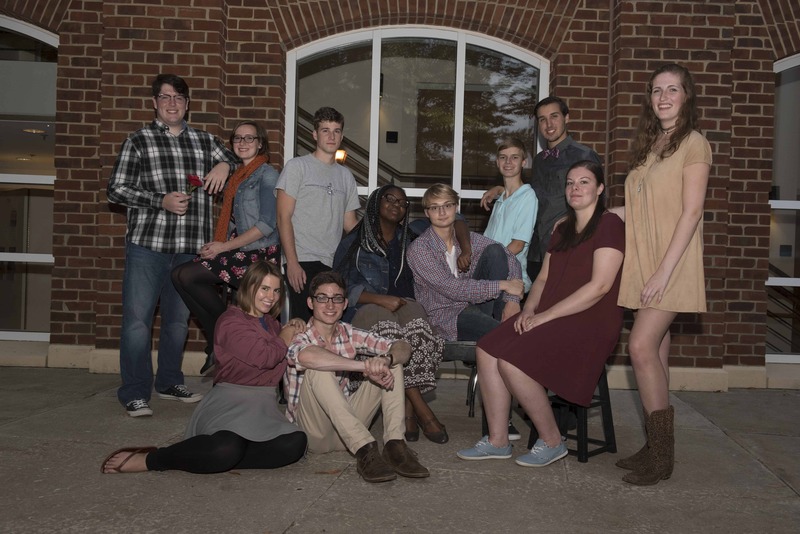 Back row, from l. to r.: Andrew Creel, Kailyn Drohan, Jim Grant, Ramonah Gibson, Will McLearn, Nick Mauer, Daniel Wetterhahn, Laura Noker and Hannah Dewing. “Places, please, for the top of the show.” It’s been a rapid-fire rehearsal period for the 11 Washington and Lee University students who will perform in “The Theory of Relativity,” opening on the Keller stage in the Lenfest Center for Performing Arts on Oct. 20. A joint production of the Department of Theater, Dance and Film Studies and the Department of Music, the show is made possible by funding from the Robert O. and Elizabeth M. Bentley Endowment. “The Theory of Relativity” will run in the Keller Theatre, with evening performances at 7:30 p.m. on Thursday, Oct. 20, Friday, Oct. 21, and Saturday, Oct. 22; and a 2 p.m. performance on Sunday, Oct. 23. Order your tickets online today at wlu.edu/lenfest-center or call the Lenfest box office at 458-8000 for ticket information. Box office hours are Mon.–Fri., 9–11 a.m. and 1–3 p.m., and it will be open two hours prior to performance time.